Many restaurant operators never fully realize the potential of their gift card program. Gift cards are available for servers to sell, but aren’t always efficiently promoted. 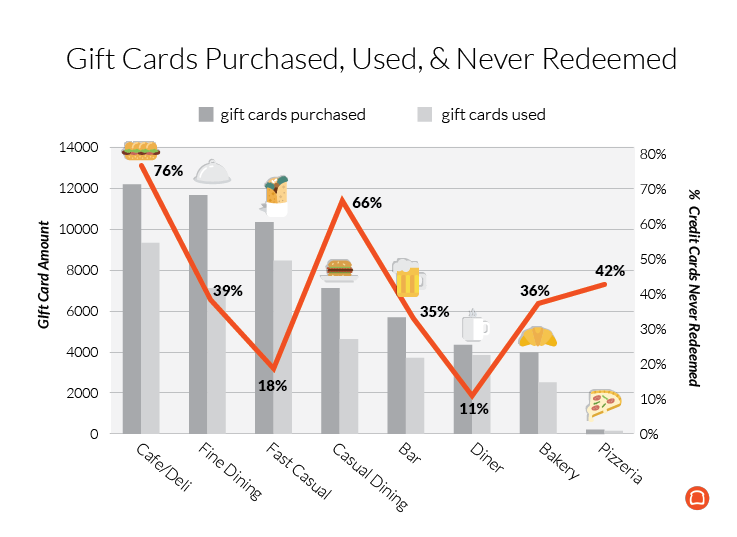 Gift card data is accessible, but it isn’t leveraged to generate restaurant gift card ideas throughout the year. To illustrate the opportunity many restaurateurs have to improve their restaurant gift card program, we decided to take a look at how Toast customers use gift cards today. 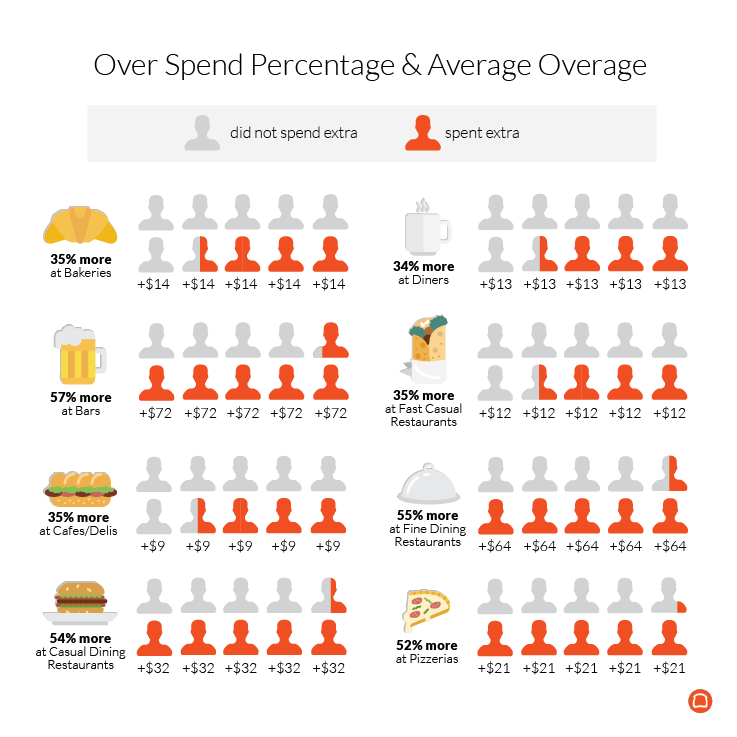 We analyzed 500+ restaurants with at least one gift card purchase in 2015 through Toast’s gift card program and segmented the data by restaurant type. All gift cards were considered, including digital and print gift cards, as well as gift cards issued by Toast and imported from other providers. All restaurant segments include at least 15 different restaurants to ensure the final analysis is conclusive. The results are in - and they might surprise you. 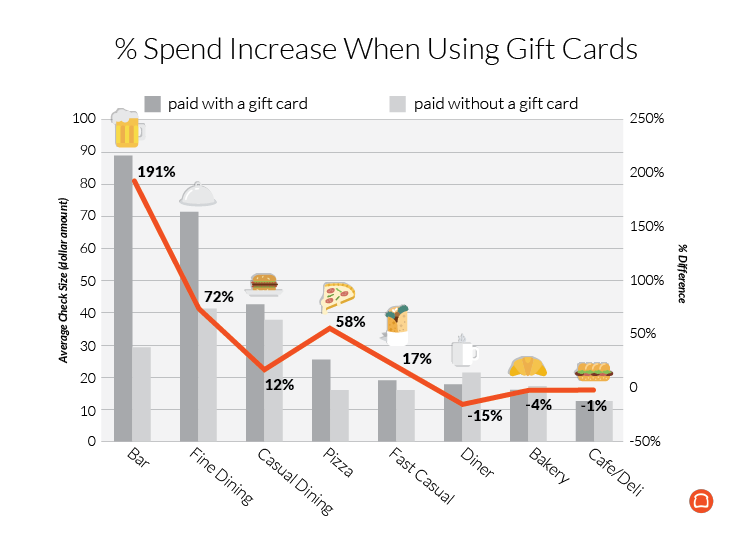 People spend 72% more with gift cards at FSRs. Guests with gift cards tend to spend much more on the check, especially at full-service restaurants. We compared two variables: total check amount partially paid with a gift card and total check amount not paid with gift cards at all. For bars, fine dining restaurants, and pizzerias, the difference is noteworthy. At FSRs, guests spend 72% more with gift cards. For other segments, especially in the quick service industry, there is no real change. Especially at full-service restaurants, gift cards can be a great revenue driver. Sell more restaurant gift cards by enabling your staff to do so. Use a gift card program that integrates with your point of sale, so servers can sell and swipe digital and print gift cards with the tap of a button. Allow the guest to personalize their gift card options, selecting the amount, including a personalized message, and choosing whether they want the gift card emailed or texted to the recipient immediately or at a later date and time. December is not the only month to sell gift cards. Many restaurants are only promoting their gift card program during the holidays, in the month of December. While this is a smart holiday restaurant marketing strategy, our data shows that restaurants would actually benefit from promoting gift cards year-round. In fact, 48% of gift card sales for full-service restaurants (FSR) and 58% for quick-service restaurants (QSR) occur outside the month of December. Diners, however, sell the least amount outside the month of December, perhaps because they only promote gift cards during the month of December. Compile a list of all holidays in the U.S. for your marketing calendar, especially those relevant to your restaurant, such as National Taco Day if you’re a Mexican restaurant. Then, two weeks before an event, start promoting your restaurant gift card program through email marketing, menu marketing, and on your digital or print receipts. As a result, you’ll sell more gift cards outside the month of December and get the most value out of the gift card product you’re using. 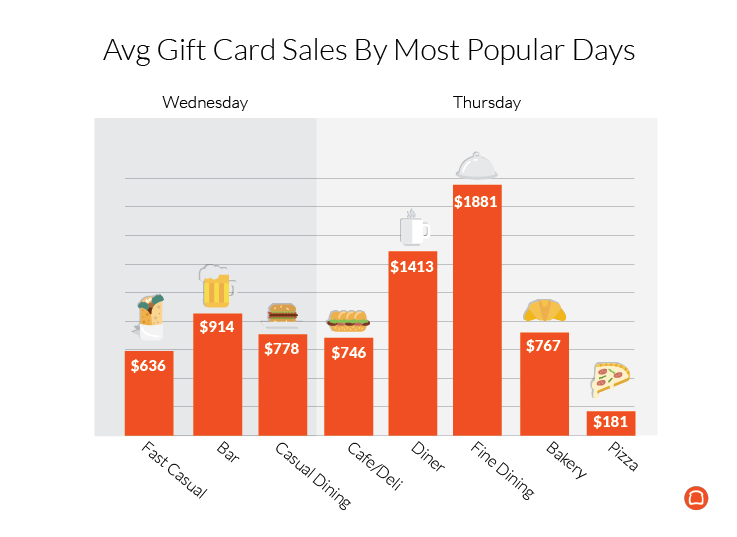 Gift card sales peak mid-week, not on the weekend. Promoting gift cards mid-week could be more effective than promoting gift cards on weekends or during the end of the week. Focus your efforts on the beginning of the week and build momentum. Use these gift card best practices to make the most of your restaurant gift card program. 29% of restaurant gift cards are never redeemed. Many restaurant gift cards are just money in the pocket for your restaurant, as 29% of them are never fully redeemed. We analyzed how many gift cards were first bought in 2015 and compared that to how many of them were used until the end of April 2016. Over that year and a half, many restaurant gift cards were bought but never used, and a small amount of gift card sales actually translated to gift card spend. When people purchase gift cards but don’t redeem them, that’s essentially free revenue for your business. Instead of making guests remember to bring in a paper punch card, allow them to access their gift card balance digitally, so they can track how much they have left to spend. You could even set up an email reminder to guests a month after their gift card was sent, reminding them to redeem it in the restaurant. With digital gift cards, guests are required to provide their email or phone number (which is automatically stored in the restaurant CRM) and select the amount they want to purchase. The digital gift card will be emailed or texted to the intended recipient. 45% of guests spend more than the gift card value when using gift cards. When using gift cards, guests spend 45% more than the value of the card at your restaurant. That means that almost half of your guests will pay even more than the gift card, providing additional revenue to your restaurant. To calculate this, we computed the percentage of the check that was partially paid with gift cards as well as total check value larger than the gift card value. Dig into your restaurant gift card reporting to learn how you can maximize this number for your restaurant. Toast reporting provides an in-depth look at all gift cards sold and transactions processed. These reports allow you to see the breakdown of all active cards, including purchased date, initial value, most recent transaction date, the server who processed the last transaction, and the remaining balance of all gift cards digital and physical cards. broken down by card number or account ID. With traditional and digital gift cards integrated with your POS system, you can improve your specific restaurants' gift card program. Gift card reporting, personalized digital gift cards, and even gift card integration with your loyalty program will help you personalize the guest experience even more.